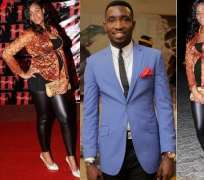 The wife of soul singer, Timi Dakolo is presently expecting their third child. The couple, which got married in 2012, welcomed their second baby few months after their union was officially legalised. This was after they had given birth to their first child out of wedlock in 2010 while both were still dating each other. At the moment, Busola, wife of the Idol West Africa winner, which produced Omawumi as the first runner-up, will soon put to bed in a matter of weeks. Both were at the AGN event for Omotola, which was held at the Oriental Hotel. At the event, Busola, cladded in a blue dress, showed off her baby bump, while her hubby, wearing a black suit, gave her a pet like a queen.